Oresund bridge in Denmark and Sweden most often called as Oresundsbron or Oresundsbroen. The Oresundsbro Konsortiet prefer to call it as oresundsbron. The best compromise between Danish and Swedish languages which would symbolize a common cultural identity of the region. People of the region becoming "Oresund citizens" and getting close as never before. The construction began in 1995 and the last section was finally constructed in 14 August of 1999. 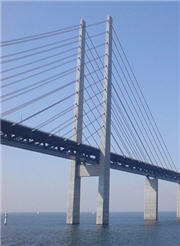 The useage of the bridge by Danish and Swedish people was not as high as expected and this affected the expense of the crossing. But since 2005 the day triffic increased a lot, this happend because it is getting more popular to buy home in Sweden and go to work in Denmark. Normally prices for real estate in Malmo is much lower than in Copenhagen ( Capital of Denmark ). The public transport by rail is operated by both Danish and Swedish railway companies. The trains run across the area every 20 minutes and about one time per hour during the night time.